From "A Tour of Christ Church:"
"The apse is decorated with mosaics, which are formed from tesserae. Tesserae are cubes of glass or vitreous enamel set in mastic or cement at uneven angles so that they reflect the light in a sparkling manner. There are said to be seven million tesserae in Christ Church. One’s eye is drawn to the figure of Christ in the apse, and the use of gold leaf for the background adds richness and depth. This representation is known as Christ Pantocratur. Pantocratur is a Greek word meaning “all powerful” and representations of Christ Pantocratur are widely used in Eastern Orthodox churches. Christ is portrayed as King and He is clad in the robes of a Byzantine Emperor. The bands on His shoulders are part of the imperial insignia and He is seated on the imperial throne. His right hand is raised in blessing – the Eastern style of blessing is used – and His left hand holds the Gospel of St. John, open at the text “I am the light of the world” (John 8:12). 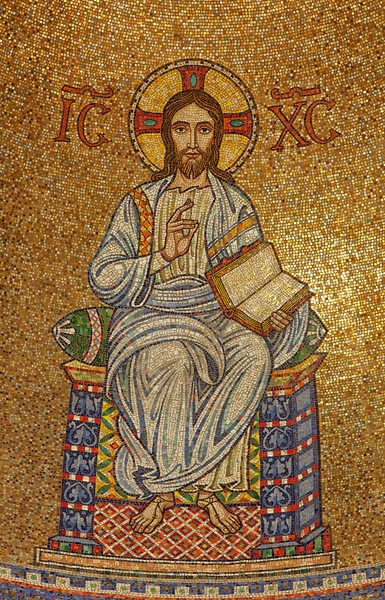 On either side of His head are the letters IC_XC_ transliterated from the Greek, and this is an abbreviation for Jesus Christ. The surrounding tesserae are cunningly set so that the figure of Christ is bathed in light."